with this type of press. 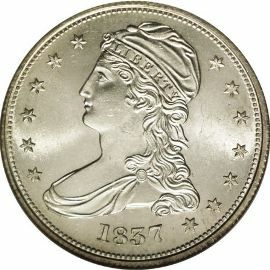 The obverse of these silver coins is similar to the half dollars that preceded them. Christian Gobrecht added some subtle changes such as reducing the size of the stars and slenderizing Liberty. The reverse shows an eagle clutching arrows and an olive branch in its talons. 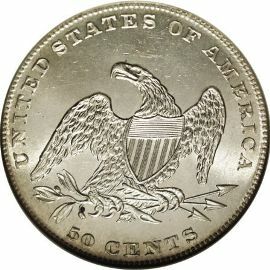 The designer removed "E PLURIBUS UNUM" and modified the statement of value to say "50 CENTS" instead of "50 C" but the basic design remains from the earlier coins.